CPU sampling settings allow to customize some aspects of CPU sampling. CPU tracing settings are specified separately, as described here. The settings are applied each time you start CPU sampling. This means you can change the settings without restarting the profiled application. To configure CPU sampling settings use Settings | CPU Sampling... in the main menu. Specify whether CPU or wall time will be measured for profiled methods. Matching methods will be measured with wall time, all other methods - with CPU time. If there are no lines with walltime specified, all methods will be measured with CPU time. 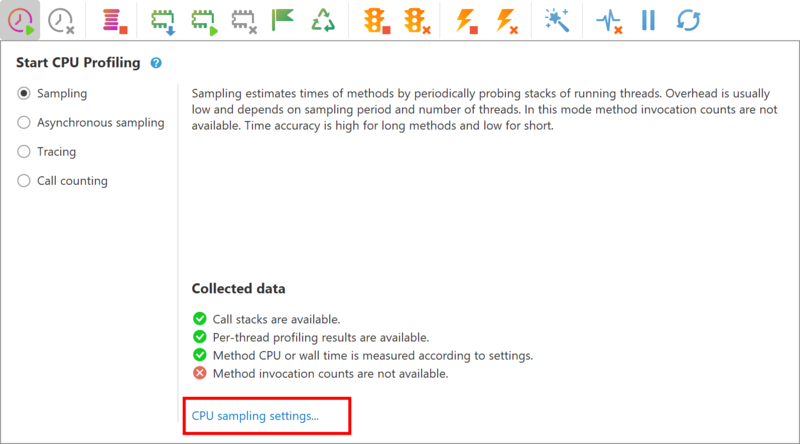 The default configuration for CPU sampling is to measure wall time for I/O methods and CPU time for all other methods. "Use Preconfigured Settings..." allows you to choose one of recommended presets. Specify how often samples are taken with sampling_period_ms=<time in milliseconds>. By default samples are taken each 20 milliseconds (sampling_period_ms=20). where user home corresponds to the account under which a profiled application is launched. This file is automatically updated in your user home directory when you apply changes in the UI (see above). You can edit this file manually, but note that it may be fully overwritten with "Use Predefined Settings..." in UI.